Populations in humanitarian contexts are especially at risk for mental health conditions due to their exposure to violence, loss of homes, livelihoods, loved ones, instability of community or social support systems and damaged health infrastructure. Integration of mental health services into general healthcare will improve the availability, quality, acceptability and accessibility of mental healthcare, while reducing costs for and stigma towards service users. Mental health integration into general healthcare is an investment for all sectors, as improving the overall well-being of communities can enhance economic development and societal welfare.1 International Medical Corps, with the collaboration of local partners, has been integrating mental healthcare into the primary healthcare infrastructure in Syria, Lebanon, Turkey, Jordan, and Iraq. “I had the opportunity to be trained and become an outreach psychosocial worker. I wanted to help my people. There are many social and family problems, gender violence, couples breaking apart, young people traumatized after experiencing atrocities in Syria, including kidnapping. These people need support due to their war experiences." International Medical Corps aims to strengthen mental health and psychosocial services through integration into PHC and community services by training healthcare staff and paraprofessionals to provide mental healthcare and expand community and family supports. International Medical Corps gathers information about the context such as national policies pertaining to mental health, staff capacities in the country, current provision of care and attitudes around mental health. This is accomplished through desk reviews, semi-structured interviews, and focus group discussions with stakeholders such as service providers, people affected by mental health problems, policy makers and community members. In Jordan, International Medical Corps piloted and disseminated the WHO MHPSS 4W (“who is doing what where when”) mapping tool and has been completing annual comprehensive MHPSS mapping of current services, capacities and needs since 2011, which informs coordination of services and filling gaps. Depending on findings from the situational analysis, feedback, and experiences, International Medical Corps adapts the World Health Organization Mental Health Gap Action Program (mhGAP)3 training materials to the local context. Where available, local specialists and psychiatrists are identified, involved in policy efforts for building local capacity to scale up training and integration, and receive a training of trainers (TOT) on conducting mhGAP training for PHC staff, and longer term support and supervision. International Medical Corps was included in WHO’s mhGAP TOT in Lebanon, Syria, Jordan, and Iraq for local psychiatrists and psychologists who were mobilized through International Medical Corps and national efforts to scale up training and supervision on mhGAP. International Medical Corps trains a range of personnel including PHC staff (doctors and nurses), other professional staff (e.g. social workers, psychologists) and paraprofessionals (e.g. psychosocial workers) and active community members (volunteers, and community health workers (CHW)) to provide comprehensive mental health care. This comprehensive approach includes non-specialized, capable staff, who are often the first line of contact, able to dedicate more time to patients, and directly manage cases that do not require more specialized interventions—for which there is a referral mechanism in place. In Lebanon, our team found that existing social workers were a valuable resource in PHC integration in Ministry of Social Affairs clinics. Facility level interventions provided by trained PHC staff consist of assessment, diagnosis and management of mental health disorders, psycho-education for patients and family members, and psychotropic medication- if needed. Interventions that take place in facility and community levels include: psychological first aid, basic psychosocial support and counselling, peer to peer support activities, and linking to other mental health, psychosocial, health, protection and other services as needed. International Medical Corps supports the provision of mental health services through trained staff at targeted health facilities and facilitates psychosocial community level interventions such as activities for youth and caregivers, educational and recreational psychosocial activities for children, and awareness/educational messaging for individuals, families and wider communities. This gives rise to the importance of training active community staff, members and volunteers, as they may have developed networks, greater buy-in and insight regarding the needs of the community. This was demonstrated in the program in Turkey, where our psychologists, social workers and community volunteers provided community-based psychosocial support through educational and recreational activities for children and adolescents, pregnant and lactating mothers, single parent families with small children and older persons to promote social cohesion and community revitalization among Syrian and other refugee populations. International Medical Corps has conducted workshops with different services providers (NGO partners, government staff, community care providers, community leaders) to improve the functioning of integrated mental health services through standardized forms, care and referral pathways, appropriate space for services and psychotropic medication supply. Referral systems can be strengthened through mapping and workshops to ensure PHC and other staff are able to provide comprehensive care to people with mental illness and their families, and are supported by specialists, non-specialist community supports, and other agencies who meet diverse patient needs. In Syria, International Medical Corps is the co-chair of a national MHPSS technical reference group and has supported efforts for developing inter-agency referral pathways between different levels of mental health and psychosocial support. Patient follow up is ensured through: psycho-education around importance of continued treatment, tracking patients through clinic registration and home visits by CHWs & volunteers, text messaging and phone calls, and linking with community leaders and traditional healers to encourage continued treatment. International Medical Corps also collaborates with government officials and local WHO mental health departments to ensure availability of essential psychotropic medications at the PHC level. In Lebanon, International Medical Corps works to supplement existing medications provided through the Ministry of Health, and works in line with the ministry’s essential drug list. Networking, coordination and advocacy occur at the national, regional, and community levels though policy development, educational/awareness activities and workshops. Partnerships at various levels enabled effective coordinating mechanisms that promote transparency and regular flows of information and referral between stakeholders, and meeting the basic mental health needs of the population8. 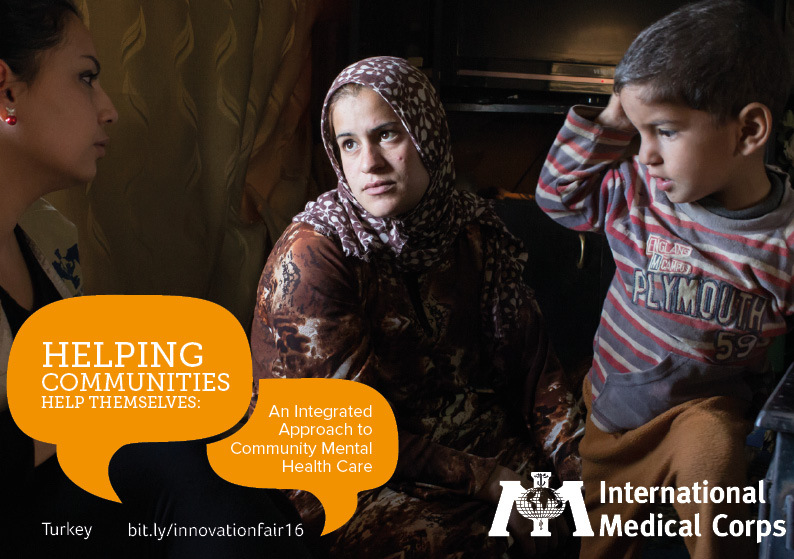 International Medical Corps is co-leading MHPSS national level coordination groups in Syria, Jordan, and Lebanon. International Medical Corps conducts significant outreach and advocacy through mobile teams in Syria, Jordan, Iraq, Lebanon & Turkey with trained health staff and social workers to reach populations in hard to reach areas. In line with International Medical Corps’ global approach, we work in partnership with relevant ministries and WHO, to develop country specific mental health programming based on an assessment of existing health systems and strategy. From the start, International Medical Corps works to maximize the use of existing government health care infrastructure and resources that are consistent with national capacities and strategies. This is to promote sustainability and a smooth transition from emergency to long term development. Continuous policy dialogue with government and key stakeholders is necessary to solve issues such as the supply of medicine, supervision, and annual planning. International Medical Corps understands that integration is most successful when mental health is incorporated into health policy and legislative frameworks that are accompanied by adequate resources. In Lebanon, we have supported the Ministry of Health in the development and implementation of their national mental health strategy. International Medical Corps’ (in partnership with UNICEF and support from different donors) supports the recruitment and financial management of the NMHP staff, provides technical support through revision of program strategies and documents and builds the team’s capacity through the development of MHPSS policies and advocacy plans. International Medical Corps is expanding integration of mental health services within ministry clinics serving refugee and host populations, improving communication and consultation among trained PHC staff and mental health specialists by strengthening referral networks, and supporting longer term supervision efforts and strategies to transition over to the ministry or local organizations, that can sustain the units following International Medical Corps support. Mechanisms for ongoing support and supervision of trained PHC staff, as part of a sustainability plan developed with national team attached to MOH (ongoing pilot in Lebanon). Adapted Health Information Systems to manage collate data in Syria and host countries on: persons with mental disorders treated in primary care, persons treated in mental health outpatient facilities, admissions and length of stay in mental hospitals. Regular coordination, discussions and collaboration with MoH and district level government agencies, line agencies, peripheral health facilities etc. Engagement with Syrians in promoting well-being through paraprofessional training and peer leadership models that empower Syrian communities to develop strengths and help themselves, increase availability of family based and community support and promote resilience and sustainability. Training of non- specialized health personnel for providing evidence based and quality services for priority mental disorders supported and supervised by local specialized mental health professionals through training of trainers and ensured follow up and supervision. Development of appropriate referral systems between primary, and secondary services to promote communication and coordination between levels to decrease reliance on agencies as referral points over time. Recognition of organizational level integration as a process and a system with various elements (availability of psychotropic medications, internal and external referral pathways, support from clinic managers, etc. ), as opposed to one off trainings for PHC providers. There is insufficient availability of trained specialized mental health care providers. In Syria, there is a lack of qualified clinical psychologists due to absence of academic psychology programs, licensure and inadequate institutional oversight. In Lebanon, mental health specialists were available but exercising long term interventions that were not suitable for the context. Current mental health service provision relies heavily on INGOs and humanitarian funding, which are not meeting the increasing needs and will likely be reduced in the coming years. In Turkey, health and mental health services are provided through INGO run clinics and INGO paid and trained Syrian doctors supervised by Turkish doctors, but such services would cease with discontinuation of funding. These supports are limited for national and expatriate staff & volunteers, who are likely to be exposed to work related stress. There is a continued need to allow Syrian (or Arabic speaking) health care providers to work with Syrian refugees in Turkish national health facilities, which would help Syrians and also allow health care providers to continue to practice and build skills. More Turkish-Arabic translators are also needed at Turkish public hospitals and other service delivery points. This program can serve as a model for future efforts to integrate mental health and psychosocial support into primary care and capacity building for settings with minimal mental health and/or psychosocial workers or services*. It also is a strong example of working with local partners and policy makers to ensure that capacity is strengthened and sustained at the country level. International Medical Corps has recently completed a case study on MH PHC integration in three humanitarian settings (South Sudan, Philippines, Central African Republic) highlighting key components of successful integration models. Client satisfaction with services measured through feedback forms administered at PHC clinics on a quarterly basis. Improvement in psychosocial wellbeing and daily functioning among persons with mental health disorders, supported through International Medical Corps’ integrated mental health services, who have successfully completed their care plans and treatment goals. Improvements in Human Resource Capacity for Mental Health: Integrating mental health services into primary health addresses human resource shortages to deliver mental health interventions. Reduction in Stigma: Stigma is reduced when seeking mental health care from a primary health care provider (compared to a stand-alone specialized service), because primary health care services are not associated with any specific health conditions, making this level of care far more acceptable, and therefore accessible, for most users and families. Improved Outcomes for People Treated in Primary Health Care: For most common mental disorders, primary health care can deliver better, more affordable and accessible care than that provided in psychiatric hospitals. We will see an increase in percentage of beneficiaries reporting improved capacity to carry out responsibilities and tasks of daily functioning. WHO (2013). Investing in Mental Health: Evidence for Action. World Health Organization (2010). WHO Mental Health Gap Action Program. ReliefWeb (2015). Syrian Arab Republic Statistical Snapshot. Humanitarian Response Plan 2016 Overview. UNOCHA (2014). Overview of Global Humanitarian Response. International Medical Corps. (2010). Anticipating the Unexpected: Urban Refugee Programming in Jordan.